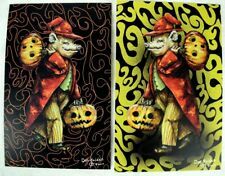 The Wizard of Swinesylvania Signed Numbered Halloween Postcard Set of 2 Fantasy! Harry Potter-Wizarding World Map Signed*11 Autographs/Signatures* Dont Miss it ! Spoontiques 1987, no. Pewter wizard with a crystal ball riding a pewter dragon. Does NOT get more magical than this. AND THE PHILOSOPHERS STONE. HARRY POTTER. RARE SIGNATURE / AUTOGRAPH & BOOK COVER. ORDER NOW FOR "SUPERFAST" DISPATCH. THE ULTIMATE J.K.ROWLING COLLECTABLE. DIRECT FROM THE UK. MAGIC LESSON -MYSTICAL PEWTER, CRYSTAL FIGURINE SIGNED P.C. SEDLOW . Condition is Used. Shipped with Standard Shipping. It is marked on the bottom "THE CASTLE OF LIGHT 3124" It is signed also. The castle is in very good condition, the original box is shelf worn. Very cool "THE JOVIAL WIZARD" by Mark Locker in pewter with Crystal ball. : Reproduction Markings: Perth Pewter, Magicmaster by Ray Lamb, 1985, 260/2500 Material: Approx. We will not send a combined invoice unless it is requested. We are not able to make any exceptions to this policy. • 1.75 lbs Solid Bronze approx (no resin). • Excellent Quality grade A bronze. Clarecraft Pottery Mythical Wizard with parchment. Handmade rare item. Vintage Cast of Thousands CA Charles McClung Frog Wizard-ADORABLE & RARE! He has a tiny nick on his foot. Otherwise adorable as can be! make Supersized seem small. Pewter Wizard Includes. Magic Not Included. Staff Missing Stone (May affect wizarding). This item is sold as pictured. World of Warcraft. 2 of each design. Large Pottery Wizard Sculpture Figurine Myth and Magic Fantasy Ornament. Good Condition apart from a chip to top grey rim, see pic 6. 3" tall Pewter Spoontiques (CMR658). Wizard holding crystal ball & staff, dragon with red eyes, owl in tree has red eyes. Signed K Fallon and dated – gold Anniversary disc to base, “10th Anniversary of Enchantica 1998.”. Wiccan carved wood / crystal walking stick with carved letters. "By Odin and Freya dedicate this staff to protect and heal others. May the goddess and god watch over my loved ones. It has 2 areas of carved letters between wrapped sections of the staff. Garden stone wonderful wizard reading the wonderful book of wizardry. Now they are made by perfect moulds which leave great detail and very few imperfections. Or copy and paste the link below and put it in your browser. AS FOUND UNCLEANED CONDITION. BE SURE TO LOOK AT PHOTOS. APRX : 23" X 35". PRINTED BY : STAR MAKERS RISING 2001.
rawcliffe pewter Krakora RF 652 1989 RARE Missing Stone . Condition is Used. These are in perfect condition. Produced in 1991, by Clay Images. Perfect condition. TUDOR MINT THE MOON WIZARD LUNAR MAGICIAN CRYSTAL MYTH MAGIC FIGURINE. Condition is Used. Dispatched with Royal Mail 2nd Class. I take detailed pictures to paint the best picture of the item. Harry Potter- Stunning Limited Edition £20 Gold Banknote - Dont Miss it ! White eyelet collar. Ring and painted on earrings. made by Russ Berrie Head, hands, and legs are made of ceramic and are hand painted. 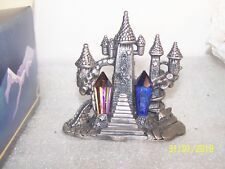 1 1/4" PERTH PEWTER 1980 MAGIC WIZARD WITH BLUE CRYSTAL Signed. Condition is Used. Shipped with USPS First Class Package. LEPRECHAUN OR WIZARD HAT SILVER PLATED BOOKMARK. SILVER PLATED.